Even if authorities allow higher densities, high-rise would still be expensive. Taller buildings cost more to build compared to lower ones. As we go higher, there are thresholds above which costs become disproportionately more onerous. Structures cost more the higher we go, as the columns on the lower floors need to be stronger and as lateral forces become more critical. Below five storeys, lifts are not considered to be necessary, but at five storeys or above, we must provide them. As we go higher, more lifts are required, not only increasing the cost of installing and maintaining them, but also taking up more space, and thus reducing net sellable area. Lifts above 20, 30 and 50 stories also get disproportionately expensive as they need to move faster and must carry longer and heavier cable ropes. With respect to fire-safety, above seven stories (top most floor 18.3m above fire appliance access level), fire-fighting lifts and “dry-risers” to pipe up water and hose-reels are required. Above 10 storeys (30.5m fire appliance access level), a wet riser, associated storage tanks and hose reels are required. As for construction, taller buildings take longer to build because there are more floor cycles to work through, because materials must be transported higher. Blocks lower than 10 stories do not even need a tower crane. In short, shorter buildings are cheaper. But can we design them to a high density? 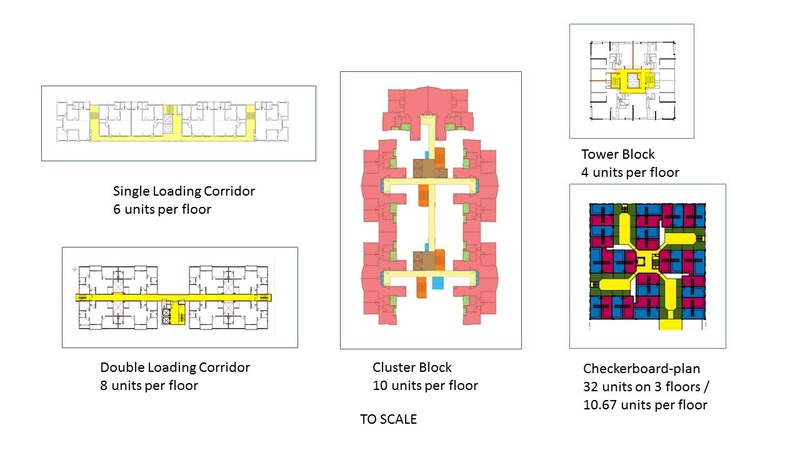 Current high-rise typologies are narrow buildings: the slab block with a single-loading corridor can be described as a single-layer of apartments; the slab block with a double loading corridor is a double-layer arrangement; the tower block, a circular layer of apartments. In housing, we want almost every room to have natural light and ventilation. There cannot be deep plans like that found for offices, where mechanical and electrical systems bring in artificial ventilation and lighting to the central portion of the building which are far away or cut off from the windows and the building’s edge. The typical Malaysian apartment will have at least the living room and master bedroom having windows on the external walls of the building and less important rooms facing an air well. The depth of the unit measured from the external wall is about 8 metres. With a 2m corridor in the middle, the total width of this double-loading corridor block layout, with two layers of apartments, is not much more than 16m. The width of the single loading corridor with only a single layer of apartments, is about half of this. The tower block, with a circular layer of apartments, can be wider; each side is typically 24m. In contrast to these existing typologies, the Honeycomb checkerboard-plan has a depth of over 40 metres. This deep plan results in a residential floor plan that covers more of the land available on as site compared to that achieved by skinny conventional floor plans. Using the available land more efficiently allows more units to be built on every floor and so can provide higher densities without having to go taller; it should become easier to achieve high plot ratios like deep plan offices. For a comparison, we take the different floor plans, apply 60’ front setback and 25’side and rear setbacks to form the minimum site boundaries for each example. We measure the area and divide it by the number of apartment units on a typical floor to show how big an area is needed to accommodate one apartment unit. The checkerboard-plan is the most efficient as it takes up the least amount of land compared with the other examples.